White Sox catcher A.J. Pierzynski and his embarrassing hair cut. Controversial Chicago White Sox catcher A.J. Pierzynski is used to getting in trouble while on the baseball diamond. He’s just one of those guys that you hate unless he’s playing for your team. That said, Pierzynski doesn’t generally get in trouble off the field, but he did recently get himself into a little legal trouble for speeding in Arizona, where the White Sox play their spring training games. The kicker? A.J. 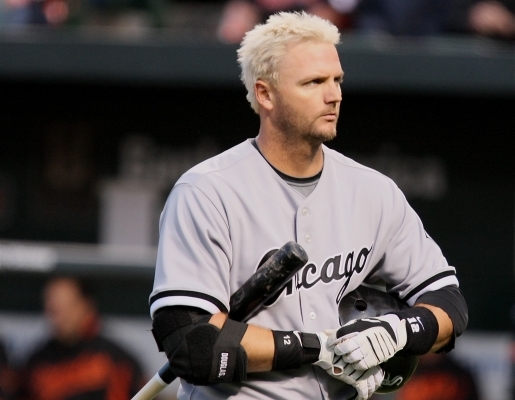 Pierzynski was given a traffic ticket while wearing his full Chicago White Sox uniform. Pierzynski was ticketed for going 75 in a 65-mile-an-hour zone while on his way to a Cactus League game between the White Sox and the Cincinatti Reds in Glendale, Arizona. A break? Ha! With the way Pierzynski is hated, he’s lucky he didn’t get a Rodney King beating. That said, it’s nice to see that there are still places in this world where professional athletes don’t get special treatment from the police due to their ability to hit a ball with a stick.